SHREVEPORT, LA — Centenary College has been designated a Tier One National Liberal Arts College for the eighth straight year in U.S. News & World Report rankings released today. Centenary is the only liberal arts college in Louisiana to earn the Tier One distinction. Colleges recognized in the U.S. News national liberal arts college category emphasize undergraduate education and award at least half of their degrees in the arts and sciences. 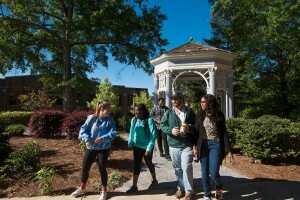 In addition to the Tier One national liberal arts distinction, Centenary was also recognized as one of the nation’s most diverse liberal arts colleges. During the 2017-2018 academic year, 34% of Centenary’s student body identified as African-American, Asian, Hispanic/Latino, or multi-racial. The U.S. News ranking system relies primarily on self-reported data from colleges and universities that is rigorously reviewed and compared against previous submissions. The ranking system also considers data from the National Center for Education Statistics, the Council for Aid to Education, and other sources to score institutions on 16 separate measures of academic quality. The overall ranking includes assessments of graduation and retention rates, faculty resources, student selectivity, and alumni giving, among other categories. U.S. News changed the weight of some indicators in the methodology for the 2019 edition of the rankings, placing more emphasis on student outcomes and less on measures such as academic reputation. The 2019 methodology has also completely removed acceptance rate from consideration in the ranking calculations while adding indicators that measure a school’s success at promoting social mobility, especially among students who receive federal Pell Grants. Centenary recently sent its fifth freshman cohort to start their college careers in Paris, France through the Centenary in Paris program. Thanks to Centenary in Paris and the College’s May Module program that sends students to a variety of foreign countries, Centenary ranks first in the nation among undergraduate baccalaureate colleges in the percentage of students who have completed an international educational experience.